Before the sun rose on the morning of April 15th, 1912, the grand "unsinkable" RMS Titanic sunk after sideswiping an iceburg. The collision punched holes in five of the sixteen watertight compartments causing the ship to take on more water than it was built to handle. More than 1500 people met their final fate that morning in the icy waters of the North Atlantic Ocean. In the aftermath, rescue ships were sent to recover the bodies of the dead: CS Mackay-Bennett from Halifax, Nova Scotia, the cable ship Minia, lighthouse supply ship Montmagny and sealing vessel Algerine. The ships carried embalming supplies, but not nearly as much as was needed and many bodies, particularly those of third class passengers, were buried at sea. On April 30th, 1912, the Cable Ship Mackay-Bennett arrived in Halifax carrying 190 bodies recovered from the Titanic sink area. A curling rink was set up as a temporary morgue since the ice would help keep the bodies cold until they could be identified. Two thirds of the victims were successfully identified and the rest were given numbers. Many of the people were buried in cemeteries in Halifax. On board the CS Mackay-Bennett was embalmer John Snow. He owned a funeral parlor in Halifax and several victims were taken there rather than to the curling rink. The building was a two story wood and stone building on Argyle Street and John Snow and Co. Funeral Home hung on a sign outside the building. Several coffins were hoisted up to a second floor room, one holding John Jacob Astor IV, and there they sat until burial. Today the John Snow Funeral Home is a wonderful restaurant named The Five Fisherman. And that second floor room that housed the Titanic victims is a wine room. Some claim that the victims never actually left the funeral home and still haunt the location. And some claim that more than just the Titanic's victims are there. The building was originally built in 1816 by St. Paul's Church of England as a public school and it later became the Halifax Victorian School of Art before the funeral home. As a side note, Anna Leonowens who opened the art school was THE infamous Anna of The King and I story. While the mortuary was located on the site, it not only housed the Titanic victims, but also those of the Halifax Explosion. Not to mention the numbers of people who died in Halifax during those years. Apparitions and ghostly fogs are seen on occasion. Poltergeist activity is reported by restaurant staff with everything from moving chairs and tables to flying glasses. There are also knocking noises and disembodied footsteps. Sinks turn off and on without assistance. Disembodied voices are heard and cold spots are felt. The Captain's Quarters behind the salad bar features an arguing couple on occasion. 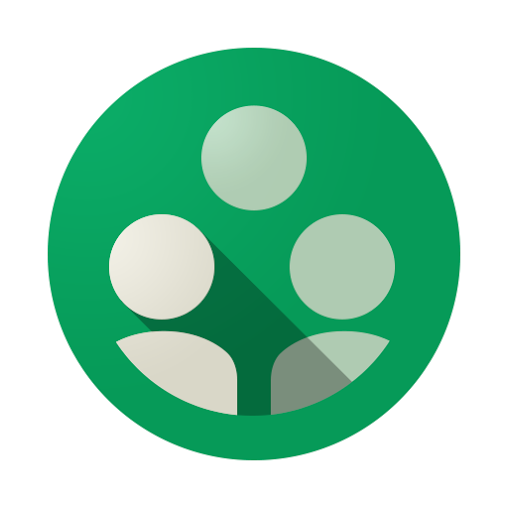 Ask a staff member and you are sure to hear an experience story. Several stories are chronicled at The Five Fisherman website. So The Five Fisherman is a great place for seafood and...the unseen. Bentonsport, Iowa is home to the nearly 170 year old Mason House Inn Bed and Breakfast. 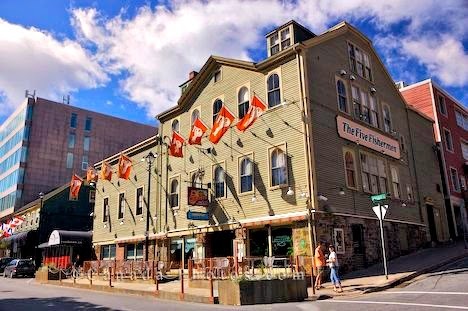 Originally named the Ashland House, the hotel was built in 1846 as a place for travelers riding aboard various steamships to stay during their travels. It was designed and built by Mormons hailing from Nauvoo, Illinois. 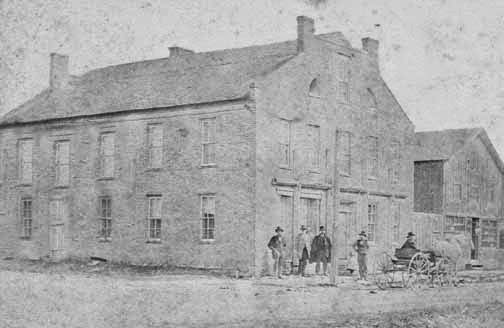 Lewis and Nancy Mason bought the inn in 1857 and the name was changed to the Phoenix Hotel. People started calling the place the "Mason House" and that is the name that has endured. During the Civil War, a short term hospital was needed to keep wounded soldiers as they waited to travel to a hospital in Keokuk. Unfortunately, many of those soldiers died at the inn. The Mason House Inn also had a secret during the Civil War: it was a stop on the Underground Railroad. The inn is ten miles from the Missouri line and it was considered one of the first stops. The runaway slaves would hide in the hay loft in the barn behind the inn. The house remained in the Mason family for 99 years and then passed through multiple hands, receiving renovations along the way. The Redhead family ran the place for thirty-three years and added the general store that is now attached to the main house and features a couple of rooms. The McDermets bought the inn in 1989 and in 2001 Chuck and Joy Hanson bought the place and are the current owners. They added the Caboose Cottage in 2006. Interestingly, electricity and indoor toilets were late in coming to the inn. The furnishings are antiques and many of them are original to the Masons. The Today Show names the Mason House Inn as one of the most haunted hotels in America. 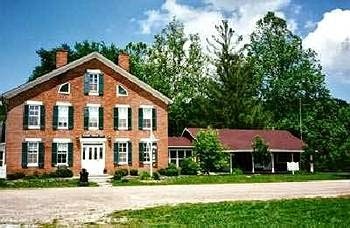 The rich history of the Mason House Inn has opened it up to numerous paranormal experiences and a large group of spectral beings. One such being is the Ghost Dog. The story goes that the dog's owner, a young woman, was shot by her estranged husband in the parlor of the hotel in 1883. The dog reacted quickly and came to the defense of his dying owner, mauling her murderer to death. The poor bereft dog died some days later when he stopped eating and was overcome with grief. He now roams the property. Lewis and Nancy Mason's daughter Mary and her husband Frank purportedly have been seen on the grounds and heard arguing. Lewis and Nancy's granddaughter Fannie had a long history with the hotel. She was born, married and died at the inn and now seems to still be walking about and smiling to guests. The history of the inn being a hospital during the Civil War has spawned various tales of men wearing Civil War garb walking around and one even likes to lay down on the beds. He also apparently likes to knock on the walls. Current owners, Chuck and Joy Hanson, have experienced countless interactions with unseen entities and Joy even keeps a journal detailing their experiences from 2002 to the current year. Siri is a virtual assistant for the iPhone by Apple. A recent date has caused much speculation on the Internet because of the information that Siri provided about that date. That specific date was July 27, 2014. An iPhone user can ask Siri about certain dates to see if any special holidays or occasions land on that date. July 27th had a diabolical answer. Siri informed users that July 27, 2014 was the opening of the Gates of Hell. While some people speculated that this date was a coded message about a coming apocalypse, Siri was more than likely referring to China's Ghost Month. During the seventh month of the lunar cycle, Chinese legend claims that the gates of heaven and hell both open. While that brings comfort, one must ask if there are actually gates to hell and if they could be opened at various times. Most paranormal researchers claim that there are vortexes that help the dead and demons cross over to the living. Could vortexes be some kind of gate? Whatever the truth may be, there are stories of a gate to hell in Denver, Colorado. The first county in Colorado was named Arapahoe County in honor of the Arapahoe Native American Tribe that had once occupied the area. The Cheyenne also lived in the area. Originally, the county was part of the Kansas Territory, but when Kansas became a state, Arapahoe County became the Colorado Territory along with sixteen other counties. William Green Russell brought a group of Georgians to the area, following word that there was gold to be had. The Russell Party established themselves where the South Platte and Cherry Creek joined and this first claim jump became the city of Denver. Denver was a rough and tumble place known for gunfights and saw its share of fires and floods. Law and order is needed in a town and eventually the Arapahoe County Courthouse was built. 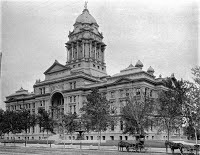 The Courthouse was designed by Harry Mellon Rhoads and its cornerstone was laid on June 24,1881. Construction was finished in 1883. The Courthouse served as the seat of government for Arapahoe County and Denver. It was a grand building built from stone with classical elements like entablature, copper domed roofs, and a Renaissance style cupola. Unfortunately, it became obsolete when Denver and Adams County were formed and was demolished in 1933. As happens so many times to wonderful old buildings, this one was replaced with a park that soon became nothing more than a parking lot. In 1957, a new structure with a peculiar design called a hyperbolic parabaloid was built on the spot. The structure encompassed an ice skating rink and a May D&F department store. It was the perfect style for the Fifties, but in the late 1990s Denver decided to move on to other things and the area was demolished once again to make room for a hotel that is currently the Sheraton Denver Downtown Hotel. But something is not right with the land there. The first indication of this came in 1900. On the second floor of the courthouse, a guard and a janitor were working. At around 3am, the men witnessed the opening of what they called the "Gates of Hell." It was actually the elevator opening, but the catch was that the doors opened by themselves and a distinct smell of brimstone could be detected. This happened many times and tales of peculiar lights along with the smell were told. Apparitions of the departed were seen and some were recognized as well. To be sure, many countries around the world claim to have their gateway into hell, one place in Turkey even has a fire burning within it that has raged for over thirty years. But this story in Denver is unique with its tales of brimstone odor. Did the elevator at the old courthouse really ferry the dead back and forth? Could the Denver Sheraton be haunted due to its location? Who knows. The city of St. Augustine in Florida is the oldest city in the United States. It is said to be one of the most haunted cities in the country and the area certainly seems to carry an otherworldly feel. On a small hill at the center of the main tourist area stands a rare medieval structure built from coquina shells, a concrete like substance infused with shells. The coquina shells are so strong that they are able to endure the blast of cannon balls. 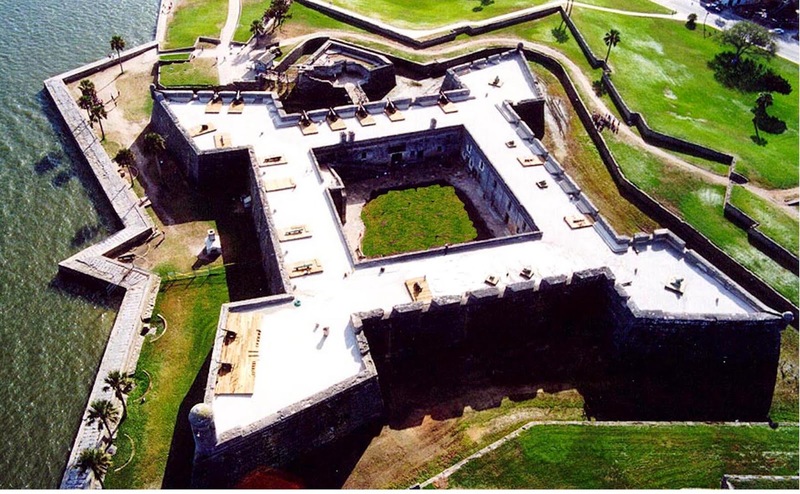 The material was perfect to use in the construction of a fort, particularly this fort found in St. Augustine, the Castillo de San Marcos. The Spanish built the fort between 1672 to 1695 to protect the city, which had been sacked several times. The Castillo de San Marcos never fell, no matter where the attack came from and it has stood under the flags of several countries or governments including the Spanish, the British, the United States of America and the Confederacy. their trade route and the area was the perfect spot from which to do that. Unfortunately, the Spanish built a series of forts that did not last because they were built of wood. Not only is wood no match for heavy artillery, it is no match for the elements in Florida. So the Queen of Spain, Queen Mariana, commissioned a stone structure be built. Oyster shells were baked until they crumbled and the material was mixed with sand and water to make lime, which cemented the coquina blocks together. The coquina blocks were quarried from nearby Anastasia Island. And the resulting fort has stood the test of time for centuries. The British tested Castillo de San Marcos several times, but were never successful in taking the fort. General James Edward Oglethorpe made the final attempt to take the fort by force, using a base of operations in Georgia. The British finally gained ownership of the fort in 1763 when the Treaty of Paris gave Britain all of Florida. The British did not possess the Castillo for very long. The American Revolution broke out and after the war was concluded, Spain again retained control of the city of St. Augustine in 1784. In 1821, the Americans took ownership of St. Augustine and the Castillo. They changed the name to Fort Marion in honor of General Francis Marion, a Revolutionary War hero, and converted the fort into a prison. Early on, most prisoners were Native Americans. During the Civil War, the Union handed over Ft. Marion to the Confederacy as Florida had joined other southern states in fighting the Union. The Confederates soon abandoned the post and the Union retook the fort after threatening to destroy the city if it did not surrender. In 1898, while the Spanish American War raged, the fort was used once again as a prison and held around 200 deserters from the American Army. By 1900, the fort was officially retired and became a national monument. 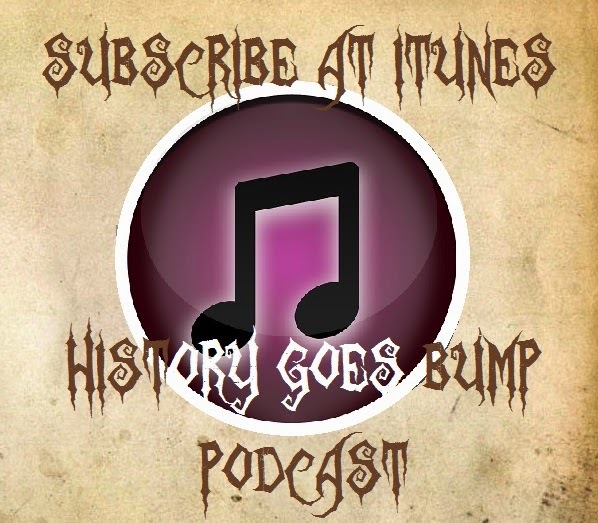 Because of the wartime past and the hundreds of prisoners housed at the fort, the possibility of paranormal activity is high and there are many tales of supernatural activity. Along one wall outside the Castillo, prisoners were lined up and executed by firing squad. To this day, many people catch ghostly images on their cameras when photographing the wall. Spanish soldiers have been spotted walking about the upper tier of the Castillo, seeming to carry on their guard duties. Booted footsteps are heard everywhere inside the Castillo. Chief Osceola's head is sometimes seen floating about. The reason there is no body is because a doctor at the fort decided to decapitate Osceola and keep the head in a jar of preservative. The story is that Chief Osceola became ill while at the fort and a local doctor named Dr. Frederick Weedon diagnosed the Chief with malaria. Osceola was sent to another fort where he died. Dr. Weedon attended the funeral for Osceola and severed his head when he was alone with the body. Now the good doctor could not just walk out carrying the head, so he wrapped a scarf around the Chief's neck and followed the body to the gravesite. He then took some time alone with the body again and grabbed the head. The doctor apparently wanted to make a death mask - could this not have been done with the body fully in tact - and he kept the head for many years. Dr. Weedon had a sick sense of humor as well and used to scare his children into good behavior by hanging the head from their bedposts. One particular cell named the Carcel has claims of hauntings. The room is cold and dark with a heavy creepy door. Many prisoners were kept in this room as special punishment. Voices are heard in the cell at times. There is also a tale about a secret room where bones were found after a heavy cannon fell through the ceiling of the room, revealing the secret place. Rumor has it that a Commander at the fort caught his wife and First Officer having an affair and sealed them up in this room to die. Did it really happen? That's for the reader to decide, but supposedly the wife's perfume wafts from the room on occasion. Or was it a powder keg room sealed up to keep the powder dry with animal bones littering the ground? Nathan Hale, a Captain in the Revolutionary War, was born in the year 1755 in Coventry, Conneticut. He was born in the obscure position of sixth child among twelve total children that were born to Richard and Elizabeth Hale, but would rise to the level of infamy as an American hero. 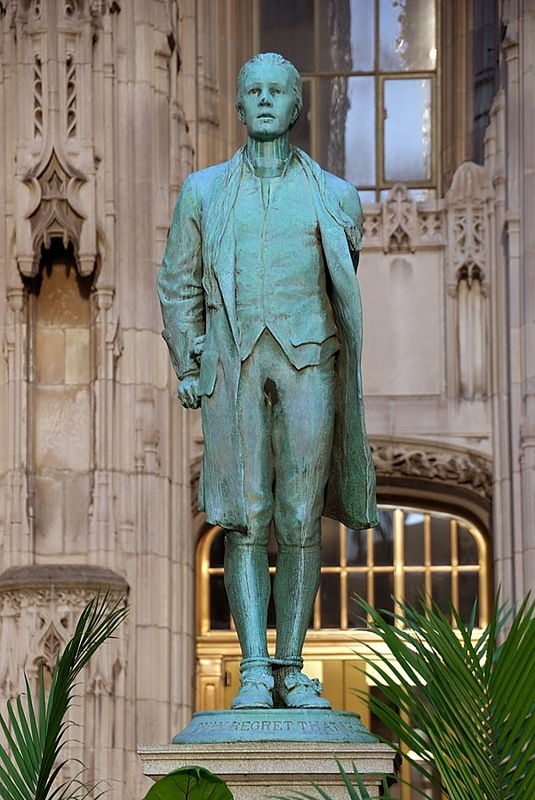 Nathan Hale attended Yale College, graduating with honors, and then moved on to become a teacher. His belief in equality led him to argue for the education of women and he began teaching early morning classes to a handful of females. He held some strong beliefs about independence as well. On April 19th, 1775, the Battle of Lexington erupted and Nathan Hale turned from his teaching to battle. He had registered with the militia, although he was not of age, and at a town meeting he declared, “Let us march immediately and never lay down our arms until we obtain our independence.” Hale was commissioned as First Lieutenant over the Seventh Connecticut regiment and his regiment helped General George Washington to win several battles. In 1776, Hale became ill and was unable to fight for some time. When he returned to duty, he attended a meeting that was held for the purpose of recruiting spies for General Washington. No men stepped forward save for Nathan Hale. He saw the opportunity as his chance to serve again since he was still weak from his illness. Nathan Hale left for New York in the guise of a schoolmaster looking for a position. He spent two weeks conducting his mission, which would come to a terrible end. On September 20th, Hale flagged a ship he assumed to be an American ship. The ship was actually a British frigate and Hale was captured. When the British searched him, they found incriminating papers hidden in the soles of his shoes. There was no trial and Hale was condemned to die by hanging the following morning. Before he was hung, Hale made the statement that is still famous today. He was asked if he had a confession to make and he answered, "I only regret that I have but one life to lose for my country." He died at the young age of twenty-one. There is some dispute as to the present day location of the hanging and the body of Hale was never returned to his family. His family erected an empty tomb in his honor in Nathan Hale Cemetery in South Coventry, Connecticut. that now stands on the property in Coventry, Connecticut. The large farmhouse sits on several acres and was registered with the National Register of Historic Places in 1970. It continues to host tours to this day. Nathan Hale did live on the property in a home that was brought down to make room for the new home. A trunk of Hale's belongings was retrieved by his brother and is located inside the home. The home was lived in by several other families after the Hales and fell into disrepair. A lawyer named George Dudley Seymour bought the home and restored it, filling it with antiques and Hale's trunk. 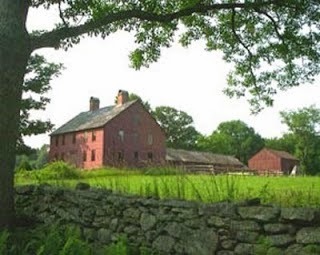 As with many old properties, the Nathan Hale Homestead has tales of hauntings. Seymour himself claimed to see the spirit of Nathan Hale's father, Deacon Richard Hale, sitting inside the house in colonial attire. Hale's brothers Joseph and John have reportedly been seen as well as John's wife. Joseph is heard more than he is seen, purportedly rattling chains like the ones the British kept him in while he was on a British prison ship. A servant of the Hale family named Lydia Carpenter is also reported to be spending the afterlife at the homestead, still cleaning and listening for gossip! Musket shots have been heard in the woods that surround the property, as well as footsteps. The Syfy Channel's Ghost Hunters has investigated the property. For Halloween, the homestead not only hosts a haunted corn maze, but also a candlelight tour of the home complete with ghost tales.